The Angles and Saxons were Germanic peoples of northern Europe who crossed the North Sea to settle in eastern Britain after the decline of Roman rule in the 5th century AD. The Anglo-Saxons were the dominant inhabitants of much of Britain before the Norman conquest in the 11th century. By the 6th century, they had created a series of kingdoms which were ruled by Germanic elites. 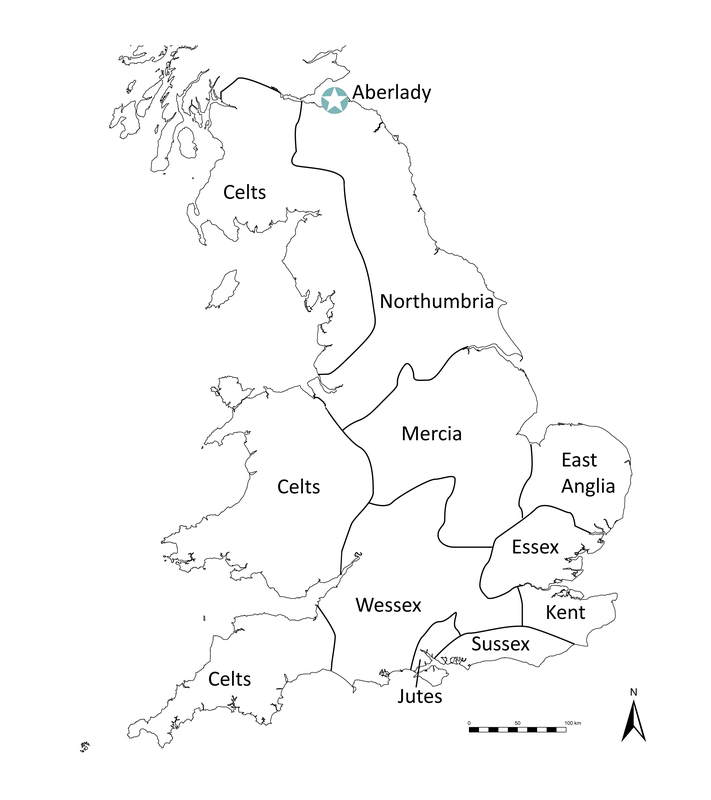 These kingdoms – including that of Northumbria, in which Aberlady was an important location on its northern frontier – extended across what we now know as England and southern Scotland. Although the Anglo-Saxon expansion was largely curtailed by their defeated by the Picts at Dunnichen in AD 685, their reach and influence can be traced in their metalwork and other goods, which are found as far north as Orkney. In the far north, such finds occur so infrequently that these artefacts cannot be seen as proof of flourishing trade networks between north and south, rather evidence of individual travel and exchange across wide geographical areas. 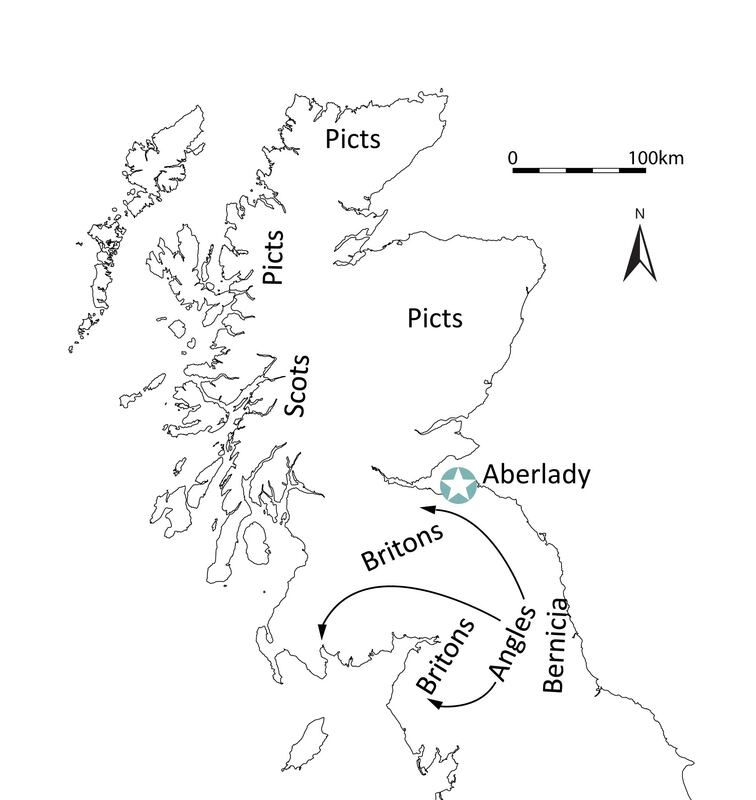 It is highly likely that Aberlady, with its natural anchorage, was an important nexus in the east coast trading links. Early historic period, early medieval period, or the Dark Ages? A range of terms are used to refer to the time between AD 400 and AD 1100. This period is sometimes known as the early medieval or early historic period, or even the Dark Ages, because so little is known about Britain in the centuries immediately after the departure of the Romans. The Picts, who occupied much of Scotland north of the Forth-Clyde isthmus, were dominant between around AD 600 and AD 900, and the Vikings between around AD 700 and AD 1100. 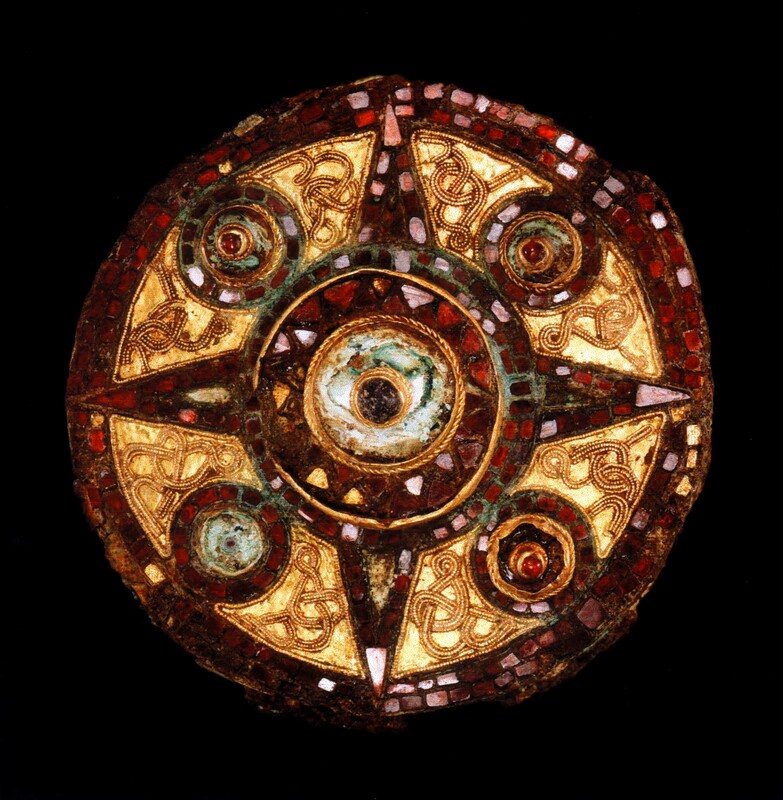 This exquisite brooch dates to the 7th century. It was found during excavations at Floral St, in the heart of London’s Covent Garden, which overlies the footprint of the Saxon town of Lundenwic. It is now held at the Museum of London. Aberlady lies within what was the Anglo-Saxon kingdom of Northumbria, which extended along the east coast of Britain from the southern shore of the Firth of Forth to the Humber. From their fortified strongholds on Edinburgh Rock (Din Eidyn) and Traprain, the Gododdin Britons held what is now Lothian and Berwickshire, as far south as the Tweed. Most of the western side of modern southern Scotland was held by the powerful Strathclyde Britons from their stronghold at Alt Clut (Dumbarton Rock). The lands of the Gododdin were fully annexed by Northumbria following the seige of Din Eidyn in AD 638. Most of the western side of Britain, including what we now know as Wales and Cornwall/Dorset, was held by Celtic tribes. The Anglo-Saxons were skilled craftspeople, and we continue to find compelling evidence of their talents. In 2009, the largest collection of Anglo-Saxon gold and silver metalwork ever discovered was unearthed near Lichfield, Staffordshire. The Staffordshire hoard amounts to over 3500 silver and gold pieces, many of which are richly decorated with garnets (red-coloured semi-precious stones that occur naturally at certain locations in the Highlands of Scotland and across Europe), filigree (a decorative technique using twisted and flattened gold wire to create a beaded effect) and animal patterns. With all this high quality metalwork, the Dark Ages seem a little less gloomy – for the wealthy, at least. It was during the early historic period that the influence of Christianity first began to be felt. During the 7th century AD, missionaries were dispatched from Ireland and from Rome to try to convert the pagan Anglo-Saxons to Christianity. The story of the introduction of this religion to Britain was chronicled by scholar and teacher Bede (AD 673-735). See ‘Anglo-Saxon Aberlady‘ for more about Aberlady’s role in the spread of Christiantity.